Rostock and sushi!? Granted, that particular Japanese delicacy is not the first thing that pops up in one’s mind when thinking of a North-eastern German city, but it actually makes an aweful lot of sense to combine the omnipresent fish dishes of Rostock with the cuisine of the Far East. Even I have to admit the excitement of Hering with Bratkartoffeln drops a little after the tenth time you’ve tasted it in restaurants all across the city. Ah, who am I kidding? Fish is love. Fish is life. But there is nothing wrong with spreading out into lesser-known culinary realms. Sushi has been on the rise for some time now, of course, as indicated by its invasion of supermarket shelves everywhere. But you and I also know that there is a BIG difference between supermarket sushi and the real, custom-made thing. Who knows when exactly that little plastic box was filled and packed? In the restaurant, you can watch the chef prepare your sushi with all the fresh ingredients you individually chose. The range of fillings is also far superior and goes beyond the usual salmon-and-cucumber-supermarket-sushi. And while the small plastic fish containing the soy sauce might be funny, getting food served on a plate does have a nice touch to it, doesn’t it? AND it is cheaper than you think. Sure, you’ll have to pay about € 8-12 per person to satisfy your belly, but that’s the same amount you would have to pay for the infamous supermarket sushi as well. Yet you have a far superior range of mouth-watering creations. But that mouth-burning experience really is part of the fun and you will be rewarded with unexpected revelations of taste most other times. My advice: Try the deep-fried sushi. Sushilicious also caters for the needs of those gravely erring friends who “don’t like sushi/fish” (Forgive them for they know not what they say) with a choice of wraps, starters and chicken sushi, so you don’t have to feel bad if you drag them there to calm your understandable sushi craving. 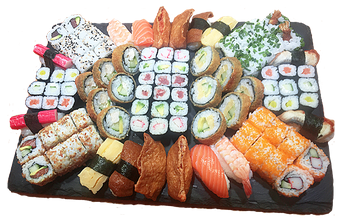 If you don’t feel like putting on pants and eating out, you can also make use of Sushilicious’s delivery service, you little couch potato 😉 After only a little ordering effort and a one hour wait, all your raw-fish-wrapped-in-cold-rice dreams can come true! Freshly prepared just for you. I am a 22-year-old student at Rostock University. I study English and History to become a teacher - So excuse me if I'm being a smartass sometimes, I just can't help it (occupational hazard). This entry was posted in Restaurants, Bakeries & Canteens, Where 2 Eat/Drink/Go Out and tagged delicious, delivery, eating out, fish, good food, rostock, sushi, sushilicious, tasty. Bookmark the permalink.